Sometimes church communication work can feel like a solitary job. That’s why we like to encourage connecting with others, whether it’s in person or online. There’s a Facebook group for church communicators that invites people to share what they’re working on every Wednesday. That’s a cool way to connect, so we thought we’d highlight what some folks in the community are doing each week. So we present our ‘A Week in the Life’ series. Today we hear from Kelon Moore. He’s the director of communications and technology at Concord Church in Dallas. He loves telling stories through pictures, film, words and music. Kelon also founded Script 16, where he can help clients and better craft his vision. Time is not on my side between now and August. This week I’m finishing mid-year reviews, preparing for a preaching conference in July, planning for Back to School season in August and planning for a big announcement our church is making in October. I’m also migrating from my old MacBook to my new one. I’m one 180 GB file transfer away from being done with that. I’m excited about a brand analysis we just dove into that will result in new building signage, a website overhaul and the launch of an apparel line. Time is not on my side between now and August. I will overcome it by working late when possible and relying on God to sustain me. Like a person has been sitting in it. Our communications coordinator has taken shelter in my office because the AC is being repaired in her office. I’m probably in my office less than four hours a week and that’s being generous. 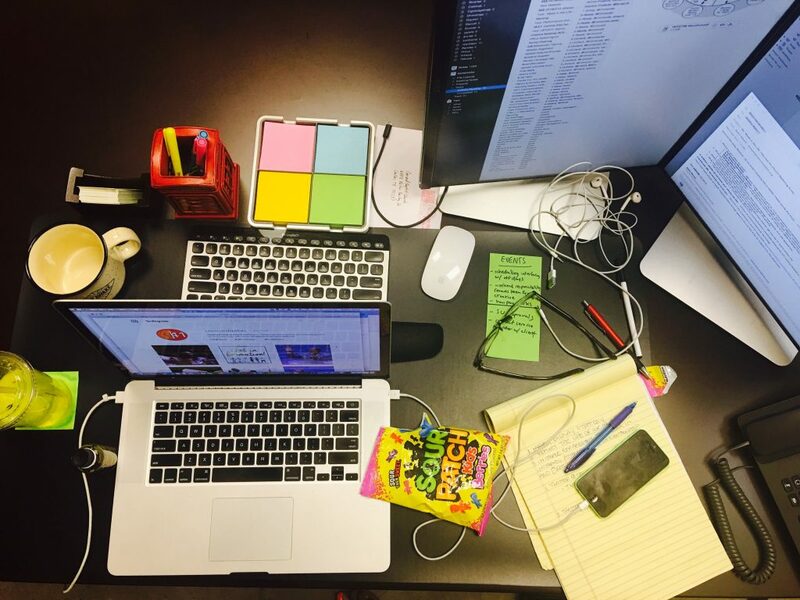 We asked Kelon to share a picture of his work space and specifically asked him not to spruce it up for the picture. Click to see a larger version of Kelon’s work space. I would like to know where he spends the rest of his time? Do you work at home or elsewhere? Me and my boss talked about me getting away from the office and being more creative, but I haven’t found the time or space for that…any suggestions?